Hi! Soooo... Kylo Ren... Well, it's my next project. I guess that I'll be learning a few new skills, hopefully. Is anyone else here in NG planning to build this? If there are any fellow Knights of Ren out there in the Nordics, I'd love to chat about the costume, do some research together, so let me know if you have any questions. *Sleeves done, but will get redone after I'm finished with everything else and hopefully approved. *2 of 3 pleated panels done. Last edited by 17113 on 25 Apr 2016, 03:18, edited 9 times in total. There are officially licensed masks available since a couple of weeks back. I would maybe start with one of those and upgrade it: it does not have the back of the helmet. I saw them in the Disney Store in Copenhagen for 250 DKK. I have seem them in other Disney Stores in Europe for 29.95 EUR. People have picked up full helmets in the US (for about the same price..) but I have not seem them in Europe. Edit: There are also smaller masks - that hang from a rack. The ones I would consider would be the full-head or half-head masks: both come in open cardboard boxes - not hanging from a rack. The tunic sleeve material is obviously piqué. That shouldn't be too hard to find. The cloak material could be worse, though. Last edited by 11327 on 23 Sep 2015, 18:50, edited 2 times in total. Awesome! Glad to see I'm not alone :-D Waiting on Sni9ers run on outer coat fabric to reopen in october (http://www.therpf.com/showthread.php?t=237811), so hopefully I have that sorted out. He's probably going to have the right fabric coating as well. Now, for the pleated part (inner part), that's where I found the most problems. Have you guys found any fabric that would work? Going for screen accurate here :P I was thinking canvas, as most people seems to do, but the kinds I found on the norwegian stores, mainly stoffogstil.no, have the wrong weave, I think. I'm going to order a sample from them to be sure Maybe more like this (? ): http://www.stoff4you.de/Stoffe/Canvas/C ... hwarz.html Ordering a sample form them too. Do you have a close up of what the fabric should look like? I would be weary in using canvas, that's a very stiff fabric that's hard to manipulate, but since I don't know what it should look like I can't say. Lets just say that I've only used canvas for making corsets, that are supposed to be almost as hard as armour. 4492 wrote: Do you have a close up of what the fabric should look like? I would be weary in using canvas, that's a very stiff fabric that's hard to manipulate, but since I don't know what it should look like I can't say. Lets just say that I've only used canvas for making corsets, that are supposed to be almost as hard as armour. There are lots of highly detailed pictures of the outfit available on the web from when it was displayed at Celebration Anaheim earlier this year. Piqué can be very supple and the piqué sleeves have double thickness. I am a fan of piqué shirts in my "civilian life" and have been considering that material for a prequel-era Jedi tunic but not been sufficiently motivated to make a new Jedi costume. How I feal when im making the costume all by my selfe..
Hah! Saw that one! Pretty accurate I belive Looking into getting the right sleeve fabric from china. I ordered some samples of what is called oxford weave cotton fabric and hopefully it's a match. 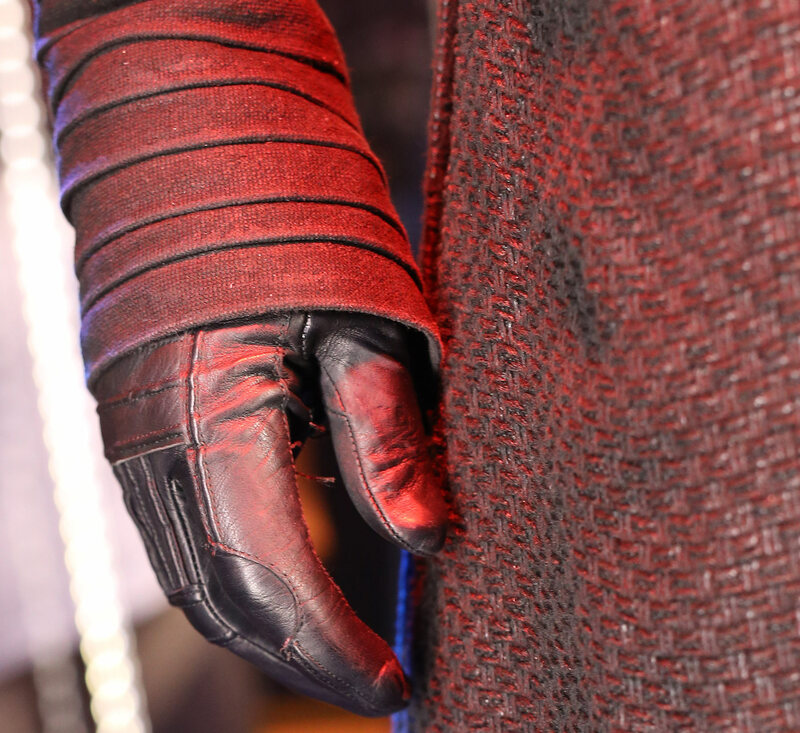 Here's a picture that shows the weave pattern pretty well, compared to kylos sleeve. I'm ordering all black, not the "checkered" kind.